City of Ember by Jeanne DuPrau. Books of Ember Series. Review: Imagine living in a city, not knowing where you are, but only knowing that something is not right. The City of Ember, The Graphic Novel by Jeanne Duprau is a great book that is filled with mystery and excitement. In this story, it is said that the city of Ember is the only light in a dark world, but when the lamps that keep Ember lit start to flicker it is up to Lina and Doon to decipher the code in order to find the way out of Ember. Lina lives with only her grandmother and little sister. But lately her grandmother has not been feeling well. She suffers from short term memory loss and when Lina comes home one day, her grandmother is found scrambling around the little apartment, murmuring about how she needs to find something. When they do find it, they find it in her little sister Poppy's mouth. It seems to be some sort of mysterious document that they believe can hold the answer. Not only are the lights flickering but supplies are also running low and everyone believes that the mayor is behind it. In this story everyone is depending on Lina and Doon to find the way out of Ember before it is too late. If you have read the City of Ember then I highly recommend you read The City of Ember, The Graphic Novel but if you haven't, I still think you are in for a treat. I think that this book is very inspirational to younger kids because it lets them know that even though they are young and aren't always expected to make a difference that it doesn't mean that you shouldn't try. I also think that if you are the type of person who just loves a good heartwarming mystery then you will love this book. 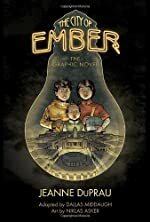 I rate The City of Ember, The Graphic Novel 5 stars for the way it captivates the reader and feels like it takes the original book and brings it to life. Review written by Lauren (6th grade student). We would like to thank Random House for providing a copy of City of Ember for this review. Have you read City of Ember? How would you rate it? Lies Beneath by Anne Greenwood Brown. Review: Do you love a book about mermaids, love, and family? Well if you do then Lies Beneath is the best book for you. These characters are Maris, Pavati, Tallulah, Calder, and Lily. Calder, Maris, Pavati, and Tallulah are all mermaids and they are family, none of them have the same fathers. Calder doesn't have the same mother or father as the girls do because their mother restarted his heart when he was little when he fell into the water and drowned. This is how he became a mermaid that was one of the ways to become a mermaid. Lily is Mr. Hancock's daughter. Calder and his family are trying to kill Mr. Hancock because his father killed their mother. Mr. Hancock's father promised his sons life but instead he drives away. So Calder's mother follows them she got caught in a fishing net. When Calder meets Lily he falls in love with her. So he follows her everywhere and makes sure she is safe from his own sisters because they will kill her instead of her father. This book is an amazing story about a merman and a human's life together. Lies Beneath made me almost cry because Calder is trying to protect Lily but Maris didn't want him to get close to her. I felt so sad for Calder because he loves Lily but he didn't think she loves him. I love the part when Calder goes to Mr. Hancock's bon fire and Lily is standing really close to Calder. When he has to leave, she gets really sad. That showed me that she really does like him. She even wants him to turn her into a mermaid so they can stay together forever. I love how the author uses so many emotions in this story. 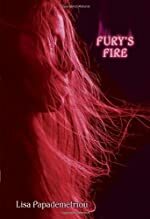 She uses love, anger, sadness, and many more feeling to describe the setting, characters, and the whole book. The characters are so realistic that you believe that they could actually be real people. If you read this you would probably think this is a really good book to read. I would recommend Lies Beneath to all of my friends because it is a perfect book for anyone. We would like to thank Random House for providing a copy of Lies Beneath for this review. 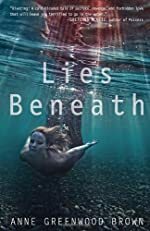 Have you read Lies Beneath? How would you rate it? Immortal Lycanthropes by Hal Johnson. 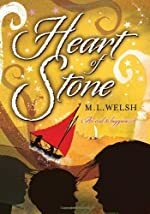 Review: Do you like books full of adventure? Well if you do you would probably like the book Immortal Lycanthropes by Hal Johnson. The main character is named Myron who is said to be ugly but he possesses the power to turn into an animal and is immortal. 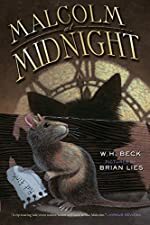 Another main character is a girl named Alice who is just like Myron when it comes to being immortal and turning into a animal. The book is about a boy named Myron that doesn't know that he is immortal until a girl named Alice tells him that he is. Along with telling him that he is immortal, she tells him that he will stay the same height, same age, and will never hit puberty like every one else in the world. After they talk about his new discovery about himself, she says that he needs training, so she knocks Myron out and leaves him in a ditch. When he wakes up, he meets Mr. Rodrigues who helps Myron out of the ditch, while making him drink fruit juice and aspirin to ease his pain. But after he heals, he finds Benson who is the villain of the story and is like Myron. They meet on the railroad tracks where Myron is still really hurt. With all of the obstacles in his path, what is in store for Myron and will he ever be the same again? In conclusion, I would say this was a good book over all mostly because of the story's suspense. But even with suspense, I would say this books ending could use some work because it didn't tell me what happened to Myron and the rest of the characters. It certainly leaves the book open to a sequel. Overall, I seriously recommend Immortal Lycanthropes to anyone that likes a good adventure. We would like to thank Houghton Mifflin Harcourt Children's Book Group for providing a copy of Immortal Lycanthropes for this review. 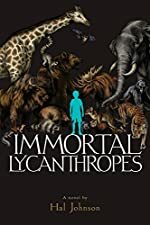 Have you read Immortal Lycanthropes? How would you rate it? 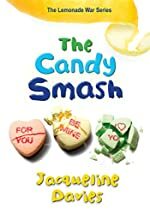 The Candy Smash by Jacqueline Davies. A Lemonade War Book. Review: Are you the kind of person who dives right into an amazing book about Valentine's Day and love? Well, if so, The Candy Smash by Jacqueline Davies is the book for you! As you are reading you will witness the secrets unveil in Mrs. Overton's class about love with the help of Jessie and Evan Treski. Jessie and Evan Treski are brother and sister and in Mrs. Overton's class together. Jessie writes the newspaper for class 4-O, and she wants to create a blockbuster newspaper in time for Valentines Day. But when Jessie starts breaking rules and taking things people want to be kept as secrets, for example a love poem Evan has written for someone things get out of hand! In the new edition of The 4-O Forum Jessie will be spilling secrets about who likes who, along with poems that people have written. Lastly, the new edition will reveal the person who puts the mysterious candy hearts in their desks. Who will it be? The Candy Smash has original characters that made me want to keep reading. It is an educational book, but is also exciting! At the beginning of each chapter the author writes the definition of a poetry term, but the author also puts in some pictures so you can imagine what is going on in the story! This book is appropriate for all audiences but, someone who has a crush will probably appreciate the well-developed ideas of this outstanding book! For someone who is having trouble with a crush, or is being teased for liking someone they will be able to relate to this story better, and may even learn how to deal with it. The Candy Smash deserves five stars because the writing style is lively and full of action, which will make you want to keep reading! We would like to thank Houghton Mifflin Harcourt for providing a copy of The Candy Smash for this review. Have you read The Candy Smash? How would you rate it? Island of Doom by Arthur Slade. The Final Installment in The Hunchback Assignments Series. Review: The Island of Doom, written by Arthur Slade and with your favorite character, Modo is the fourth book in The Hunchback series, as well. 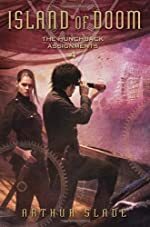 In the fourth (and maybe final) book of the series, Modo continues to try to track down his parents, while also continuing fighting the Clockwork Guild, a horrible ÒkingdomÓ of monster-makers. Old friends and enemies return to either aid Modo..... or the Clockwork Guild. As usual, Octavia (his almost-wife mate) is there to fight with him, with even a few tricks of her own! I recommend this book for audiences 10 years or older, as its words are complicated and some of its details might be somewhat gory. We would like to thank Random House for providing a copy of Island of Doom for this review. Have you read Island of Doom? How would you rate it? What Came From the Stars by Gary D. Schmidt. Review: Can Tommy Pepper save a planet's last hope or his own? Read What Came from the Stars by Gary D. Schmidt to find out. Tommy Pepper is in the 6th grade at William Bradford Elementary School in Plymouth, Massachusetts when he receives a green and silver necklace. Strange things begin to happen to Tommy and the people of Plymouth. Tommy's mother has died, and the necklace he received brings back memories of his mom. The chain is from a planet called Valorim, and it has special powers. Unfortunately, Lord Mondus is seeking the necklace, and he will stop at nothing to get it. In my opinion, What Came from the Stars is an average book. There were a few suspenseful parts, and I enjoyed the storyline, but there was not enough action to suit me. I prefer less dialogue and more thrilling events. If you like books about special powers, you may appreciate this book. Check it out the next time you visit the library. We would like to thank Houghton Mifflin Harcourt Children's Book Group for providing a copy of What Came From the Stars for this review. 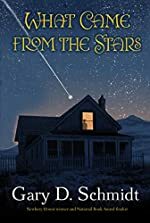 Have you read What Came From the Stars? How would you rate it? Review: "I don't want to leave!" said Mavis Betterly. "It's only until Christmas," answered her mom. May Betts, a young girl, has to live with strangers for six months because it will help her family bring in a few extra dollars. 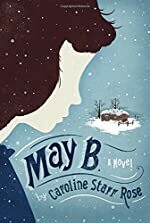 May B., a novel by Caroline Starr Rose is a fascinating cliffhanger that kept me flipping the pages! Keep reading to find out more! In this story, a young girl has to live with strangers, the Oblingers, who live about six miles away from her home. This story is set in the 1900s, and back then six miles was a considerable distance. When May arrives, she longs for home. She views the Soddy, a home made out of soil used in the old times, and she knows that the Oblingers are new to the prairie life. Upon meeting Mrs. Oblinger, she hates her right at that moment. As the story goes on, Mrs. Oblinger decides to return to her former home because she can't stand this Òawful lifestyle." Mr. Oblinger goes after her and leaves May all by herself. She waits and waits. Days pass, weeks pass, until one day a blizzard comes. Snow is piled around the Soddy, including around the door. May is stuck inside with only one apple and a pie. One day, May B. hears a sound at the door. She realizes it is a hungry wolf. Will May survive? Will anyone find her? I couldn't take my nose out of this book! If you like suspense and adventure, this book is perfect for you! Caroline Starr Rose is an amazing new author that keeps me engaged and surprised. Without food or hope, and with danger lurking outside, what will happen to May B.? I recommend stopping at a library and checking out this book! It was perfect! Review written by Monica (6th grade student). 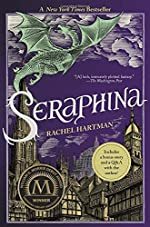 Review: Seraphina is a good young adult fantasy book written by Rachel Hartman. It is appropriate for ages twelve and up. The story focuses on Seraphina Dombergh, who is a very talented musician that has a secret she is desperate to keep. Although it is not clear if this book will become a series, after reading the book it is really hard to believe that the story won't be continued in a second book. This book is about a world where humans and dragons are trying to live together in peace. Dragons can change into human form called their saarantras so they don't scare the humans. In truth though, the humans don't trust the dragons, the dragons who are very mathematical, feel that humans are weak because of their emotions, but are amazed by their music and art. Shortly after Seraphina starts her job as assistant music mistress at the palace, a member of the royal family is killed and it seems to be the work of a dragon. Seraphina, along with Prince Lucian Kiggs, the captain of the palace guards, work to figure out the truth behind the murder. Meanwhile Serephina finds herself trapped by her secret and fears that in solving the murder, the truth about her might come out. She has spent her life trying to conceal the fact that she is a half-dragon. People like her are not supposed to exist and she lives in fear of what may happen if anyone were to find out. Although I really did enjoy this book, there were a couple of things that I didn't like. First, the beginning of the book is difficult to get through because the story moves very slowly. Due to the premise of the book, a lot of background and explanation has to be done before the actual story can get underway. I also had a hard time with some of the big vocabulary words in the story. I think it is necessary to have a dictionary nearby while reading this book. Overall, though, I really liked this book. The premise behind it is fascinating and I thought it was very suspenseful. About halfway through the book, I found it extremely hard to put the book down. The characters are well developed and entertaining. I said before that it is hard to believe that the story won't be continued in a second book and that is because the reader really becomes attached to the characters. After I finished the book, I found myself wondering what the future held for Seraphina and I imagine most readers would feel the same way. I think a second book is almost a necessity. We would like to thank Random House for providing a copy of Seraphina for this review. Have you read Seraphina? How would you rate it? Moon Pie by Simon Mason. Review: Do you like edgy, new, and fascinating books? Well Moon Pie would probably interest you! This book is family-friendly, modern, sometimes even sad, but mostly very funny! This book is filled with dreams, and being true to yourself. Simon Mason has written another amazing book! Eleven-year-old Martha lost her mother. Now she is in charge of everyone because she is the lady in charge in the house. Soon after her mother's death, Martha's father started acting weird. He fell off of a roof, went to the doctor, and he didn't come back that night. It was up to Martha to make her baby brother, Tug's, favorite pie that night. Later, they went to visit Marcus, a friend that is in love with Hollywood and everything about it. Marcus makes a nice jacket for Martha, but for some unknown reason, she hates it, even though she personalizes it. Something gets Martha in a mood! She starts having many tasks that keep getting harder and harder. Martha would like to solve almost all of her problems by baking some delicious pies. In my opinion, Moon Pie is a brilliant book. It has many descriptive scenes and in interesting ways the book comes alive. If you don't like it at first, I bet that after 50 pages, you will love it as much as I do! Moon Pie contains many spectacular details and it is written beautifully! The plot of this story is so interesting, that I wanted to keep reading and reading. The characters were also so fabulous and entertaining! This story makes a lot of sense and is an interesting read for people that are fascinated by action-packed books! Go to a library and check it out now! Review written by Caroline (6th grade student). We would like to thank Random House for providing a copy of Moon Pie for this review. 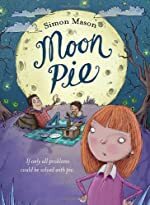 Have you read Moon Pie? How would you rate it? Laugh With the Moon by Shana Burg. 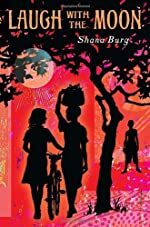 Review: Clare wished she were anywhere else in the world than an African village, with no friends, no pizza, no phone reception, or any of the comforts of her home, smack dab in the middle of nowhere. 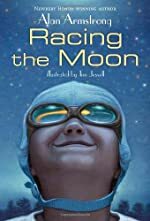 In Laugh with the Moon by Shana Burg, Clare's dad is a doctor, and when he packs up to travel away from everything Clare has ever known, she has to come along. In Laugh with the Moon, we learn that Clare has been through multiple hardships in her life, as her mother has recently passed away. Going to an African village isn't exactly the vacation of choice. When Clare arrives at the little African village where she will be staying, Clare's dad introduces her to an orphan girl named Memory. Memory knows what it's like to lose loved ones, though Clare is not ready to talk about her mother. She doesn't fit in at her new school, but that's where she meets new friends. When Clare's friends decide to show her the beautiful beach, they set out. However, the trip is not as they had expected, and when Clare finds her heart broken once again, she turn to Memory who is also hurting. Read this story to find out what happens next as the two girls deal with the hurt that life has thrust upon them. Laugh With The Moon is a vividly detailed book that shows emotions and characteristics that make the reader feel like they are in the story. When the characters cry, the readers' hearts will swell with emotion. When the characters laugh, the readers will smile. The characters seem realistic, and when the readers finish the book, they will feel like they actually know the characters. The plot was never boring or tiring, and nothing went on for too long. Although, I would have liked more suspense, the story was overall exciting. As I read the story, I was never confused; I felt like the background of each of the characters was explained. In conclusion, Laugh With The Moon is a well developed, clever, and colorfully written book, that is appropriate for people that like heartwarming stories about love, loss, and the power of friendship. Review written by Krista (6th grade student). We would like to thank Random House for providing a copy of Laugh With the Moon for this review. Have you read Laugh With the Moon? How would you rate it? Phoenix by Jeff Stone. The Five Ancestors Out of the Ashes Book 1.
Review: Have you ever wanted to read a book with excitement, action, and suspense? Then Phoenix is just the book for you. 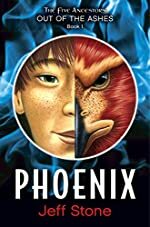 The book I did my review on is Phoenix by Jeff Stone. The main character is a boy named Phoenix. The book is book one in part two of the Five Ancestors series. The second part is called The Five Ancestors: Out of the Ashes. This story takes place in modern times both in China and in the U.S. It starts with Phoenix and his ÒgrandfatherÓ (who was really another of his ancestors, born in 1638) living in Indianapolis. Grandfather got robbed of his supply of dragon bone, a mysterious substance that helps both physical performance and the ability to live longer. Since grandfather had none left and was more than 370 years old, he would die within a month. Phoenix had to go to China to get more of the necessary dragon bone. Phoenix encounters many exciting events along the way like meeting a girl named Hu Die, and an encounter with the temple leader, Grandmaster Long, and even a battle scene with flash grenades and motorcycles! What was most exciting was a shocking truth revealed at the end, but you'll have to read the book to find out what it is. I like this book for several reasons. The plot is really suspenseful at times like when Phoenix was fighting another bike racer and suddenly, the other racer lashes out and knocks Phoenix out with his leg. The characters are believable in the story based on what they do. Their actions are something we would do in real life. I think the theme is, Òcheating never gets you anywhereÓ. The robbers tried to cheat by taking the dragon bone for themselves, but they failed. The theme is an important message because in real life, people often cheat to get what they want. Learning the negatives of cheating is a powerful lesson. The author's writing style is extremely descriptive and you can picture the whole book because every scene is filled with imagery. This novel contains a lot of fast paced action; with exciting events like when Phoenix encounters Grandmaster Long, and there is a huge ÒfightÓ (Phoenix is proving himself worthy for Grandmaster Long). The setting is pretty realistic because the story is set in modern times. Another thing I like about this book I can connect a substance like dragon bone to steroids because they both boost people's physical performance. There's nothing I don't like about this book because it was so good. I think this book would be good for kids 10-12 to read. Review written by Nathan (6th grade student). We would like to thank Random House for providing a copy of Phoenix for this review. Have you read Phoenix? How would you rate it? Sons of the 613 by Michael Rubens. Review: Do you like books with adventure and comedy? 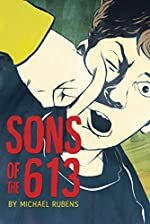 Then you should read Sons of the 613 by Michael Rubens! The main character in the story is a boy named Isaac who is about to have his bar mitzvah. But then his parents abandon him; they leave him for a trip to Italy. His brother, Josh, who never lost a wrestling match and gets in bar fights, is put in charge. When his brother finds out that Isaac's tutor hasn't been showing up to teach him about his bar mitzvah, he decides Isaac shouldn't have to give a speech to become a man. Instead, he is given a quest involving many different challenges and hardships. Along the journey he gets into various, unusual situations. He starts to fall in love with his brother's friend, Lesley, goes to bars, and almost gets killed by dogs. Sons of the 613 is literally the best book I have ever read! It has constant humor, action, and suspense and was very thrilling. It is written very well and would be appropriate for kids 14+ because it has some inappropriate parts. I give it 5 stars because it is a very great book that will keep you wondering until the end, with the constant question: Will Isaac survive? We would like to thank Houghton Mifflin for providing a copy of Sons of the 613 for this review. Have you read Sons of the 613? How would you rate it? The Wednesdays by Julie Bourbeau. Review: Have you ever been walking through a bookstore, not sure what to buy? If you ever see The Wednesdays by Julie Bourbeau, tear it off the shelf and buy it! This is a humorous, witty, and just plain phenomenal book starring an average boy named Max Bernard. But pretty soon, he'll be anything but average! You'll have to read the book to get the full story though. Max's village is like any other ordinary little town. People bustle around, go to work, and go to school. Normal things. Every day of the week. Well, except for Wednesday. On Wednesdays, the townsfolk shrink back into their houses, lock the doors and windows, and close the shutters. Why, you might ask, do the citizens do this every third day of the week? Because of the Wednesdays, of course. The bringers of bad luck. If you go out to walk your dog on a Wednesday, there is a very good chance that you will trip and scrap your knee, and your dog will run away. Everyone in Max's town fears them. 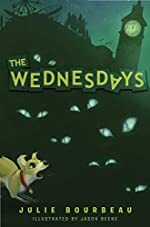 Max is determined to find and capture a Wednesday, but gets more than what he bargains for when they find him! Short, squat, and plump figures with large silver eyes, squarish heads, and long, gangly arms is a way of describing the Wednesdays. And then, bad things start happening every day of the week! Max fears he is becoming a Wednesday, as he begins to get the complexion of one! He is afraid of being near his own family, as bad things always happen when he's around. Will he ever get his normal life back? I loved this book because it can entertain you through and through, and it's nice and short. The characters are all different from each other, and some of them are pretty wacky. If I were to rate this on a scale of one to ten, I would give it a 9, for sure. If you have a road trip or vacation coming up, I would definitely recommend bringing this book along as a quick read. I wouldn't recommend this to older kids or adults, as it is short, larger font, and pictures. I would suggest kids 9-12 to read this book. This book is sure to deliver a few good laughs, though. You never exactly know what the characters are going to do, as they are almost all as wacky as the other. Overall, I loved this book, and I think you should consider reading it! Review written by Andy (6th grade student). We would like to thank Random House for providing a copy of The Wednesdays for this review. Have you read The Wednesdays? How would you rate it? 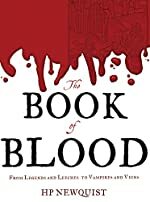 The Book of Blood: From Legends and Leeches to Vampires and Veins by HP Newquist. Review: The Book of Blood is a nonfiction book. First, it shows how blood is important, how it goes through your body and makes sure you are healthy; second it explains how people discovered how important blood really is. The book starts out explaining red blood cells and how your heart works along with your arteries and veins. Then you go back to ancient times, when the Nile floods and when Aztecs sacrifice people to their gods. Then the story progresses through time. This is a book that at times captivates you and keeps you interested with juicy and interesting facts. However, sometimes I felt tempted to skip the selection because of how boring it was. The book was exceptionally gruesome. I do understand the book is all about blood, but sometimes it goes over the limit. For example, the book shows pictures such as a stream of blood bursting from a man's arm or a picture of a brain of someone that was dead. I skipped some of the pages because the pictures were too disturbing. I also felt like it was a textbook. I did learn a lot from the Book of Blood though. Many interesting facts forced me to continue reading. Something I thought was very interesting was how the history went through time and explained how it was kind of like evolution. Some parts left me wanting more information, and that led me to look online. The book had some humor in it, and when it did, it nailed it. Many parts of the book made me laugh. Review written by Luc (6th grade student). We would like to thank Houghton Mifflin Harcourt for providing a copy of The Book of Blood: From Legends and Leeches to Vampires and Veins for this review. Have you read The Book of Blood: From Legends and Leeches to Vampires and Veins? How would you rate it?